I rarely have work done on my guitars. My car receives maintenance at least once a year but my guitars ... only when something is wrong. I might have to reconsider that. Fortunately hardly ever something is wrong with my guitars but that was not the case for my ES 350. I was never really that happy with its intonation since I bought it 7 years ago. I had the impression that the bridge was placed wrong and I could never move it manually so some fool had probably glued it on the top and not even in the right place. To boot, the tuners that were on it were getting weak. Lately I had stopped using it regularly due to intonation and tuning problems. The guitar always sounds great and - it being a thinline - is very comfortable to play so great for gigs. Somehow I did not know who I could trust to solve the problem - I was not that aware of really good local guitar techs - so I left it in the case more and more. Bad coping strategy. 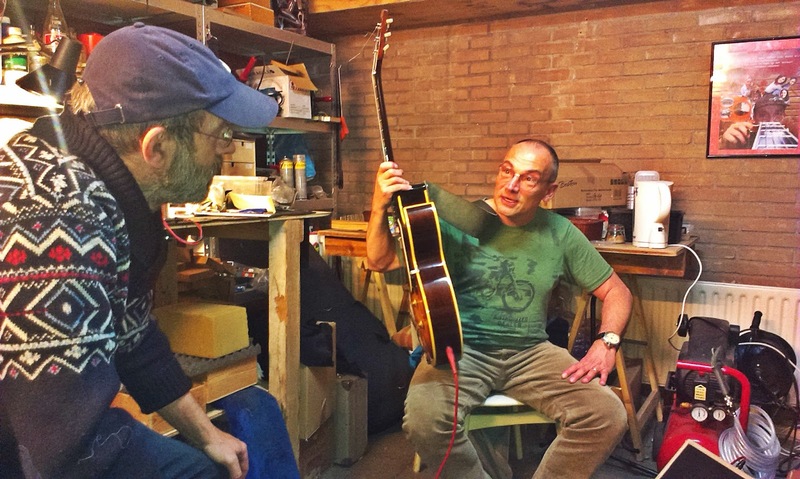 When I heard a friend had taken his guitar to Ad de Peffer in Waalwijk, I looked up his webpage and things looked great. 25 years of experience as a guitar tech! I orderered a set of new tuners (exact replicas of the Gibson Deluxe tuners that were on it) and made an appointment for a complete overhaul of the 350. 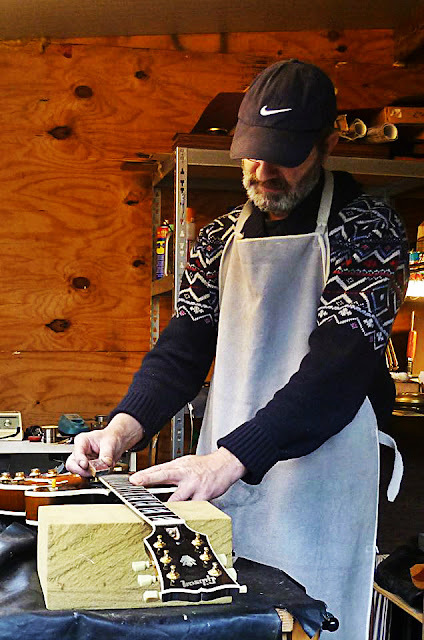 In the workshop behind his house Ad told me about his philosophy.He stated that the basis of his work on guitars is to have the guitar to first show what it really sounds by removing tensions from the wood, starting with the neck. He completely releases the truss rod for a while and looks for unnatural tensions in the body woods due to shrinkage. He then tries to correct those if he can. Only then does he start on other repairs or maintenance work on fretboards, nuts, bridges and what have you. Ad is very busy fixing many guitars from people all over the country so I had to wait for a week to get it back. Still, he kept me updated regularly via Facebook. Indeed, some fool had the bridged glued on the top but he loosened it without any damage being done. So now the real healing could begin. When I picked the 350 up a week later I was pleasantly surprised instantly but when I got home and really took the time to feel and hear the guitar for a while I was pretty amazed. It felt so much better and the intonation was flawless. The frets were like new, all fretwear gone and freshly crowned. The fretboard was very smooth. New tuners that actually work were on it. Heck I swear it even sounds better, more lively. Like I have a new guitar! The morale? Even a guitar needs some maintenance after a number of years. Well the 350 is ready for the next decade, that's for sure. For Ad's website, click here. Ad De Peffer knows what he is doing and also his passion and dedication for his great art of work is really incredible. I bring all my guitars to him with satisfaction.